How did you start cooking and making a living from this business? I am not a chef by training, I learned cooking and the restaurant business working in various kitchens, cafes, restaurants in London as a busboy, waiter or other and a manager. Turkish culture has a long tradition of service and the restaurant business gave me an opportunity to continue that tradition in London. I also knew that I wanted to work independently. So, I found a partner to invest with me and opened my first restaurant in Waterloo. What is your impression of what British and international audiences perceive Turkish cuisine to be? 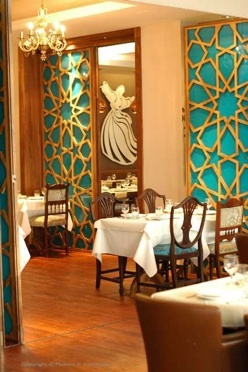 Many people who come to our restaurants are previously unaware of the Turkish cuisine. But we have many repeat customers. It saddens me to see so many package tours that offer all-inclusive vacations to Turkey, during which the tourists, perhaps visiting Turkey for the first time, have no incentive or opportunity to leave their resorts. Their only exposure to the Turkish cuisine is what is offered in all-you-can-eat buffets. They come back unaware of many of the sites, culture and tastes of what our country has to offer. Did you have to adjust the authentic recipes to specifically appeal to and address the tastes of your local clientele? I adjusted some of the recipes to bring more color. For example, my kısır has 20 ingredients and is therefore richer, more colorful. I also adjusted our cooking to have less fat than what you might find in Turkey. At our restaurant, you can have a meal, then a coffee, perhaps dessert. But we try to make sure you never leave feeling heavy or uncomfortable. What is your secret to making your business a success? Good ingredients are key to good taste. We bring many ingredients directly from Turkey or make them in house. We make our own bread and baked goods, except for baklava. We have our own organic fruit juice brand. We recently entered into an agreement with Kavaklidere to create our own wine. We have our tarhana and eriste made in Turkey just for us. We have a warehouse for all the ingredients we bring from Turkey, and it caters to all of our restaurants. What about locations and recipes? In our recipes, we try to stay with the authentic taste while creating an atmosphere that makes eating a social experience. Eating is not only about filling your stomach. We create an ambience that is appealing, attractive, comfortable and clean. Also, if you look at all of our restaurants, you’ll see that they are all located in very busy locations and close to the major attractions such as the British Museum. Your most recent venture is Hazev. How did you come up with the design of the restaurant and the menu? I chose everything for this restaurant, scrutinizing every detail from the sinks to the wall decor. We tried to use individual, antique pieces of furniture to the greated extent possible, and make each piece unique. So for example, we covered many of the chairs with a variety of fabrics we brought from Turkey. I wanted to use motifs from our Anatolian culture, hence the Selcuk designs and Mevlana figures on the walls especially because Mevlana theme symbolizes tolerance. We even set up a carpentry workshop to make the pieces you see here. There is a bar, a café and a store which sells a limited selection of Turkish products, and we bake everything we sell on the premises. I also paid special attention to keeping the prices quite reasonable. One day, one of our customers even asked if I was a member of the Turkish mafia and laundering money here with such incredible prices! I think education is critical for developing a country. I grew up with 6 sisters and I now have two daughters. Their education is very important to me. In Eastern Anatolia, there are still families who do not send their daughters to school or they have them drop out at a very early age. This has to change. I sponsored the building of a school in Kars. In the future, I want to open a school in Istanbul as well. As recent as fifteen years ago, London had a bad reputation for having limited food options. Fish and chips and meat pies, perhaps some Indian standard fare were the local foods of choice, and nobody in their right mind would travel to London for a rich, diverse culinary experience. Well, the world has certainly changed. London transformed itself to become a European culinary capital with delicacies from around the world as well as celebrity chefs like Jamie Oliver, Heston Blumenthal, Gordon Ramsay with global reputations surpassing many. With such a diverse and competitive dining scene, one man is making the taste of Turkish food better known and appreciated. 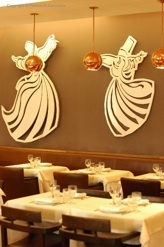 Önder Sahan, one of London’s most influential Turkish restauranteurs, has made it his business to promote Turkish cuisine and educate his customers about it. He does this every single day, and he does it well. His nine restaurants spread all over London serve over 15,000 mostly British clients every week. During our visit to London last month, we had the opportunity to sit down with Onder and talk about his background, his secrets for success and how Turkish cuisine is perceived outside of Turkey. Here is what he had to say. 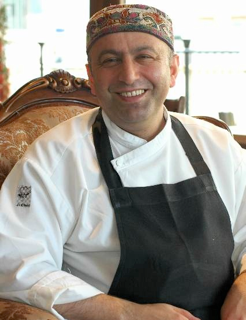 Önder Sahan from Kars is the owner of nine Turkish restaurants spread across London, all of which are in busy locations. He has personally trained the head chefs at each and continues to take an active role in their management. His first restaurant, TAS Cut in the Waterloo area of London, was recognized as the best vegetarian restaurant in its neighborhood within the first year of its opening. That was eleven years ago. His latest venture, an upscale and elegant restaurant, lounge and cafe Hazev, - at which he is the Head Chef - opened its doors last year in the trendy Canary Wharf area of London. Onder Sahan has been living in London for 20 years. While keeping up with the needs of his growing enterprise, he also tries to give back to Turkey. He buys and brings his ingredients, even his furniture directly from Turkey. A few years ago, he became a sponsor for a school in the Sarikamis village close to Kars.